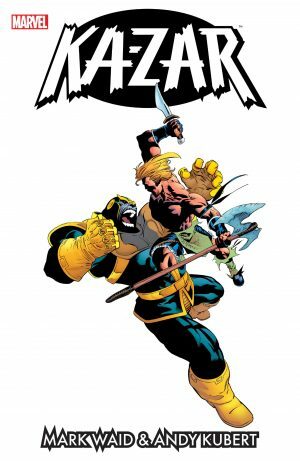 In some ways it’s astonishing to see Masterworks collections of Ka-Zar material, because if there’s been one consistency about the character he’s always worked better as a guest star than a headliner. 1980s material by Bruce Jones and Brent Anderson is a possible exception. 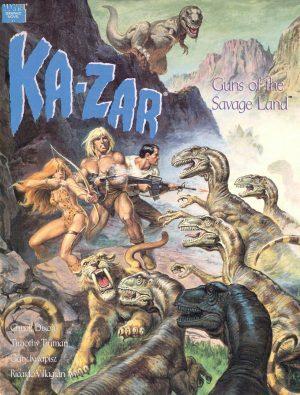 Ka-Zar as lord of the Savage Land where dinosaurs still live opens great visual possibilities, more so than a sabre toothed tiger in the streets of New York, where Ka-Zar begins this collection taking him to 1974. 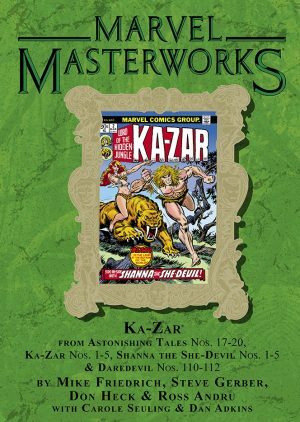 In his introduction Mike Friedrich relates how much fun he had writing Ka-Zar, but unfortunately what he produced is poor, featuring largely third rate villains constantly explaining themselves, convenient endings and artificially padded plots. 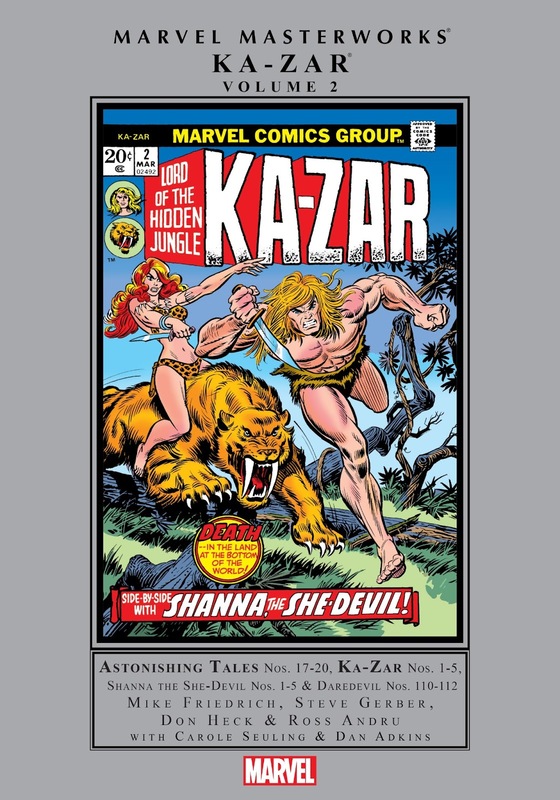 The lack of ambition is thrown into sharp contrast by the inclusion of five Shanna the She-Devil strips, included on the basis of a partnership with Ka-Zar that begins after her solo stories. Carole Seuling wrote those, and is a little more guarded in her introduction, but rightly highlights how she attempted to infuse the stories with real world problems such as ivory poaching and the slave trade. Before going overboard with the praise, however, it should be noted that this is within the context of an attempt to breathe new life into the 1930s pulp jungle heroine archetype, although in her early days Shanna wasn’t as prone to exploitative artists. Here she’s still vaguely credible as a nature loving doctor who’s trained hard to develop her self-defence skills, and under George Tuska she begins her career in a one-piece leopardskin swimsuit. It’s subsequent artist Ross Andru (sample art right) who introduces the more exploitative bikini outfit, but he’s otherwise excellent, years of experience producing absolute storytelling clarity. Seuling also introduces the Mandrill, now reduced to a stock maniac, but here sinister and interesting with a specific purpose. 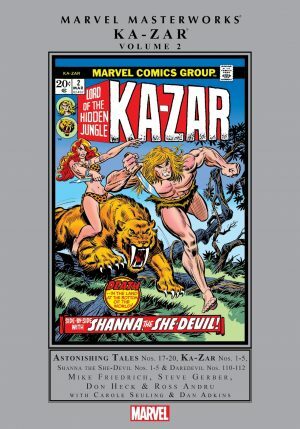 Despite the mundane plots and average art, Ka-Zar proved popular enough with the readers of the early 1970s to be promoted into his own title. 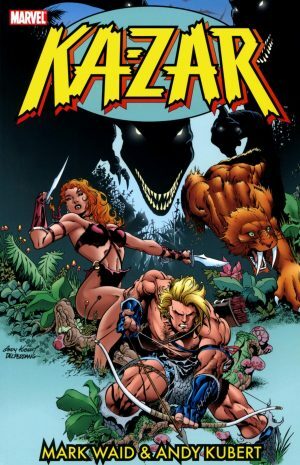 In principle Friedrich uniting Ka-Zar with Shanna in a series of stories combining the Savage Land with sword and sorcery tropes ought to work, but Friedrich lacks the imagination to pull this off. His method of turning the local people against Ka-Zar is good, but the remainder of the opening story is dull and derivative. It’s as literary gold however when compared to the three following episodes, with no sparkle to the accompanying art of Don Heck (sample art left). Steve Gerber provided the dialogue for Seuling’s Shanna plots, and subsequently incorporated Shanna, Mandrill, and Nekra into a Daredevil story with the Black Widow and terrorist organisation Black Spectre. This is nowhere near Gerber at his offbeat best, but he provides credible origins for the villains, escalates their threat to the USA, and introduces an unpredictability absent elsewhere in this collection. The inclusion of the Silver Samurai is a wild card too far, the ending too rapid, and it’s shame Bob Brown splits two nice chapters of Gene Colan art, but there are more surprises and innovation to the content without Ka-Zar than anything featuring him.